29 year old Lauren and her young daughter Emily travel from the US to visit an old cottage on the North Yorkshire Moors bequeathed to them by their distant uncle. Shortly after their arrival at the dilapidated cottage, an old friend of the dead uncle visits with some hospitality. Despite Lauren's reluctance, the old woman conducts an impromptu séance and things rapidly begin to go wrong. Within 24 hours, Lauren and Emily are fleeing from the police across the dark, bleak Yorkshire Moors with nowhere to go. Lauren wakes up in bed in an old and unfamiliar room. She has a gunshot wound to her shoulder and a badly sprained ankle. Watching over her is Len, the kindly rescuer who took her in. Initially warm and generous, Len soon becomes unpredictable and quick to temper. A relentless, intense psychological battle ensues - she, ever more desperate to save herself and Emily, and he increasingly psychotic. Ever fearful of his unpredictable, violent mood swings, she tries to placate him in order to be reunited with Emily and to escape. As her strength improves, Lauren continues to probe into Len's past. But it's dangerous; she can never be sure where she stands with him. When Len's history is finally unraveled, it is far more terrifying than she could ever have known. He carries the darkest of secrets and he needs Lauren to absolve him. 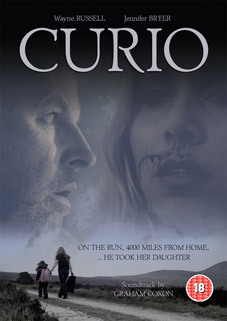 Curio is the award winning psychological thriller and directorial debut from York-based film-maker Steven Nesbit. Featuring a desperately turbulent and angry soundtrack by Blur guitarist Graham Coxon (described by the musician as "Pink Floyd with Fangs"), the film has drawn comparisons with other hits of the genre such as Misery, Psycho and The Sixth Sense. Winner of Best International Film at the Los Angeles Movie Awards, and featuring Sydney Wade (The Damned United, Doctor Who, Marchlands), Curio wil be released for the first time on DVD by ISIS Ltd on September 12th 2011 at the RRP of £10.99.